Pakistan is unlikely to be on a list of the most popular winter destinations. More often than not it seems Western minds have a negative image of the country. 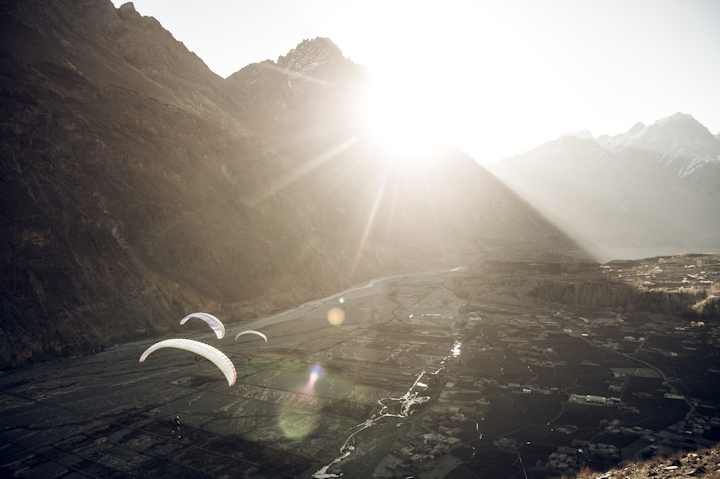 But it’s the charm of the new and unknown that makes the heart of four Tirolean alpinists beat faster. 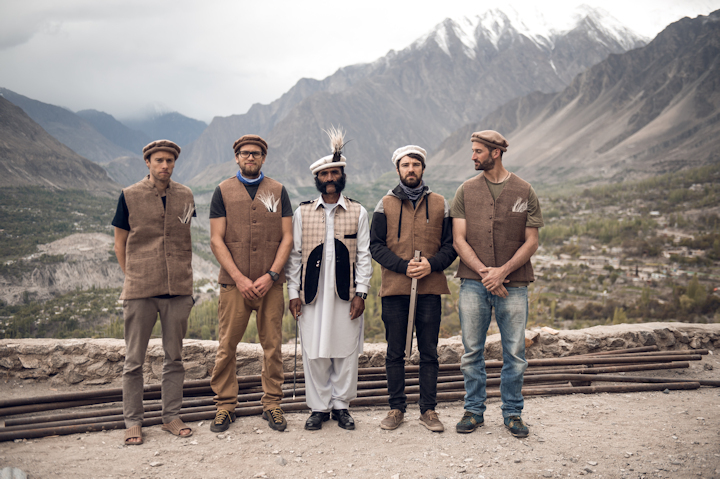 In the spring of 2018, Andreas Gumpenberger, Stefan Ager, Martin Sieberer and Thomas Gaisbacher set out on an uncertain expedition to the northeast of Pakistan. 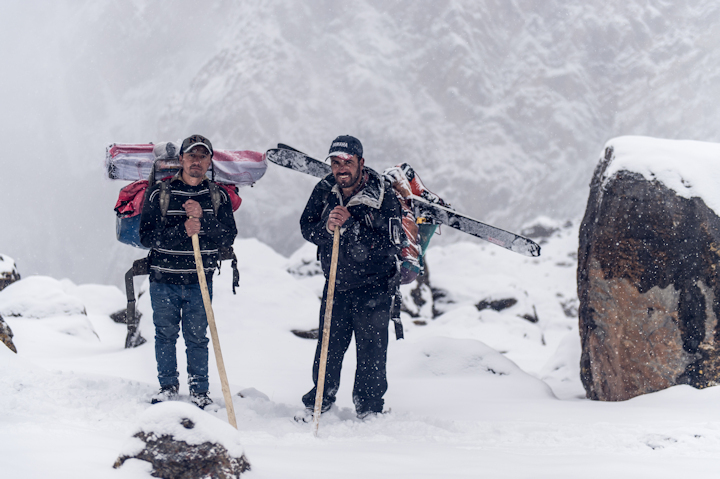 Accompanied by cameraman Johannes Aitzetmüller and photographer Andreas Vigl, the mountaineers and steep skiing specialists journeyed to the Shimshal Valley, in the midst of the mighty Karakoram Mountains, to ski high mountains far from civilization. Pure suspense was abundant from the get-go, there were many hurdles to overcome long before a ski boot was buckled. The first problem being that information about this area is rare to say the least. So, why travel to this country anyway? 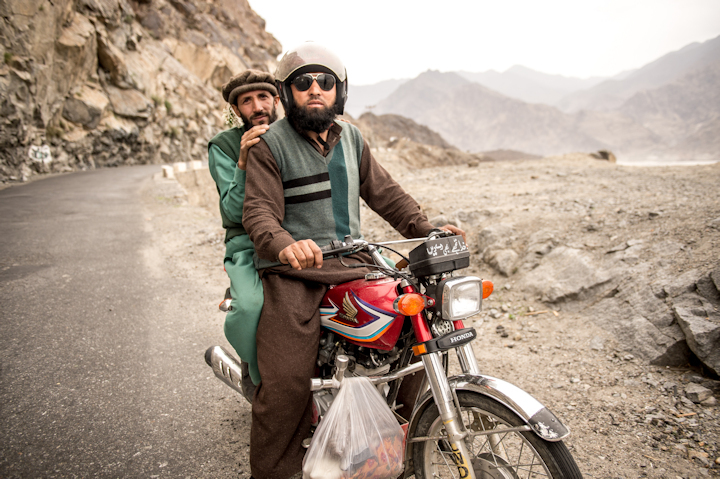 For two of the Tiroleans, Stefan and Andreas, it wasn’t their first trip to Pakistan. For some years, the two were involved with a ski held annually in collaboration with Samina Baig. 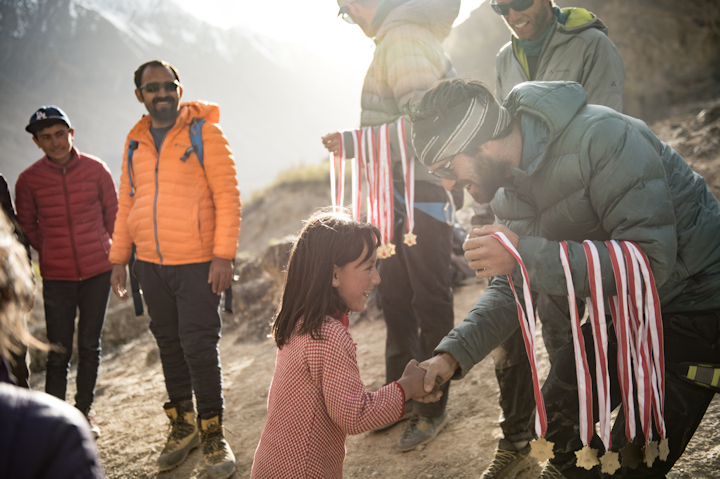 Samina is the first and only Pakistani woman to climb Everest and all "Seven Summits". She is a national heroine and uses her status and story to pass something on to the teenagers of this area. 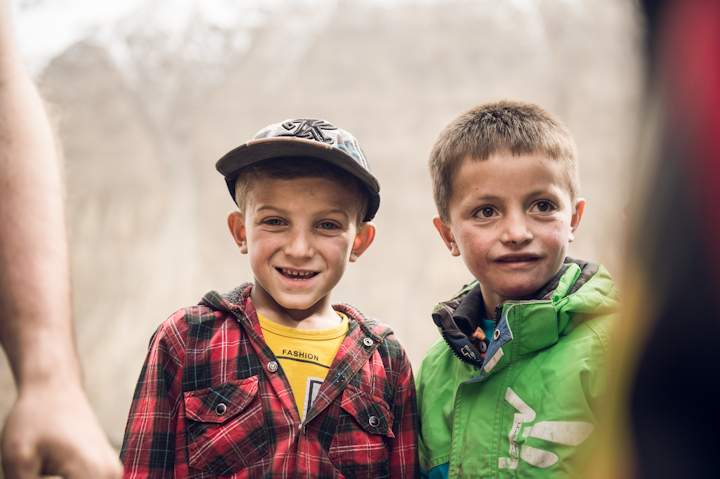 The ski course, which always takes place at over 4,000m, could not be enthusiastic and motivating and provided Stefan and Andreas with a unique opportunity to connect with the local people. So, for this expedition, like previous expeditions, the Austrians decided to give something back to the locals once again: Together, they built a climbing garden in awe-inspiring scenery and ran the first climbing course for the young people. Amidst this special landscape is one particularly striking peak, the Shimshal White Horn. This particular mountain was the spark that ignited this entire project. Shimshal is a very remote village near Pakistan’s border with China. 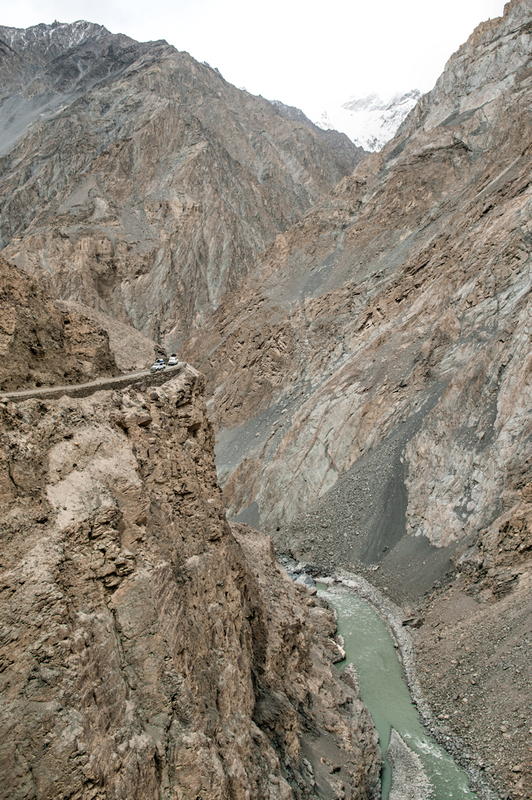 At the end of a very exposed and extremely dangerous road is a place far from civilization. 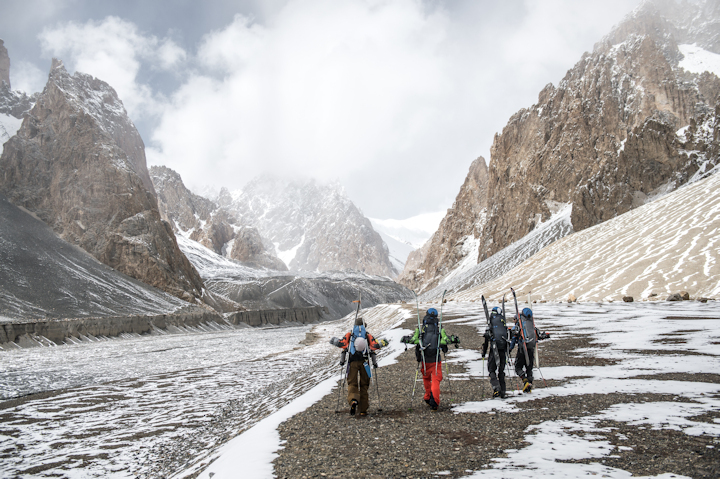 Shimshal is surrounded by the steep rock and ice walls of 6000m peaks. Among these peaks is the "Shimshal Whitehorn", with its impressive north east face. 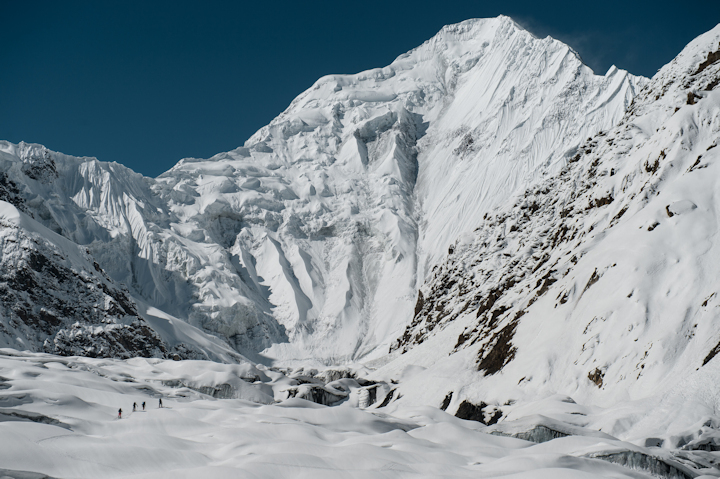 The face is considered highly dangerous and research told us it was still unclimbed, let alone skied. It was exactly the kind of project to attract the four Austrian alpinists. 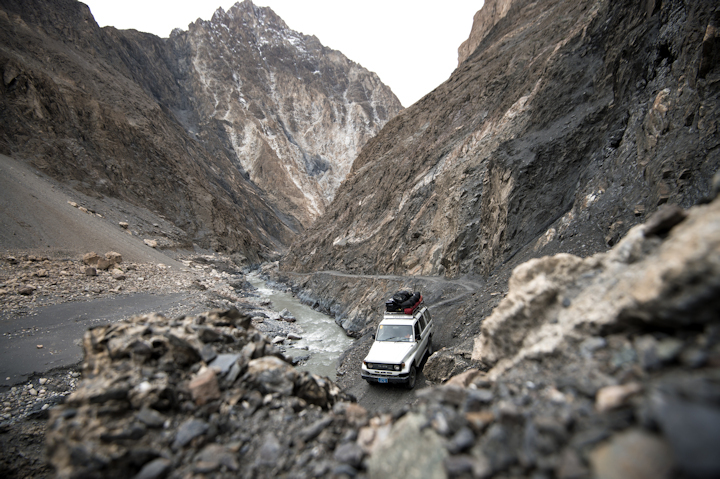 It was my third visit to the Shimshal valley, in northern Pakistan’s stunning Karakoram range. I’d visited for the previous two years, teaching the local children to snowboard and ski, but this time there was an additional component to my visit. Visible from the village stands a mighty peak, like something straight out of a picture book, called Shimshal Whitehorn. 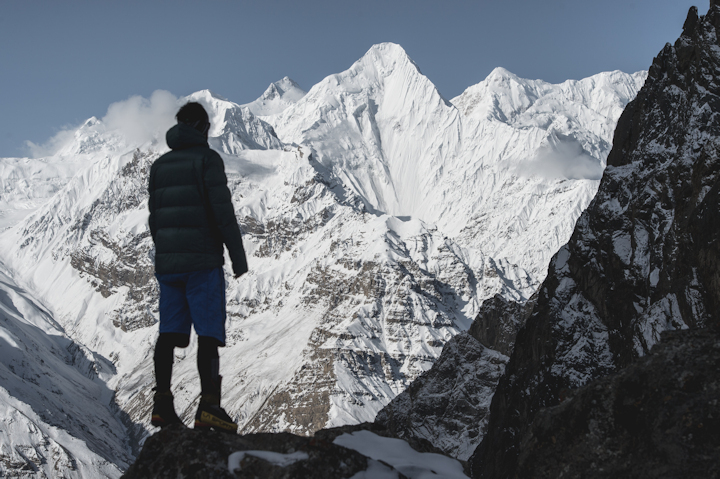 It’s about 6500m high, and the north face remains unclimbed and unridden, by snowboard or skis. 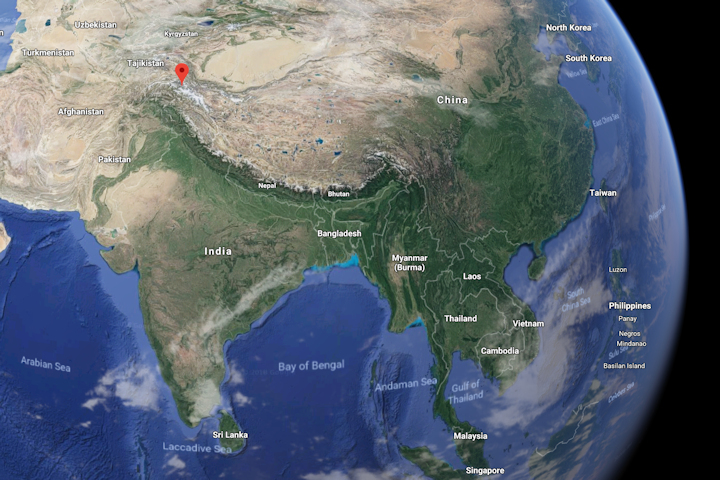 The area is incredibly remote. 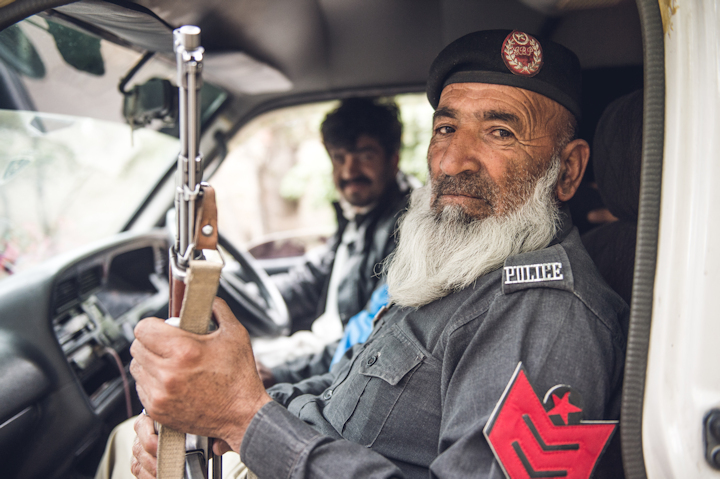 The journey to get there starts with a three-day drive from Islamabad to Shimshal. The Road gets increasingly exposed and dangerous from day-to-day. Only a handful of drivers are permitted to drive there. When you enter the valley, you enter a different world. 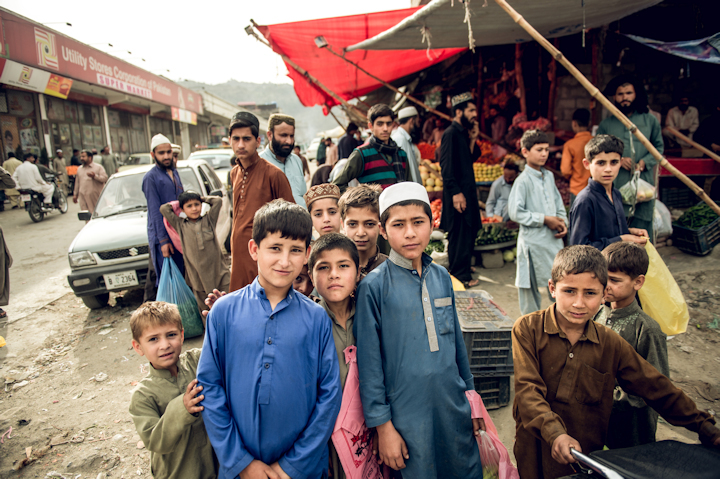 The village itself is small and independent… it has to be. 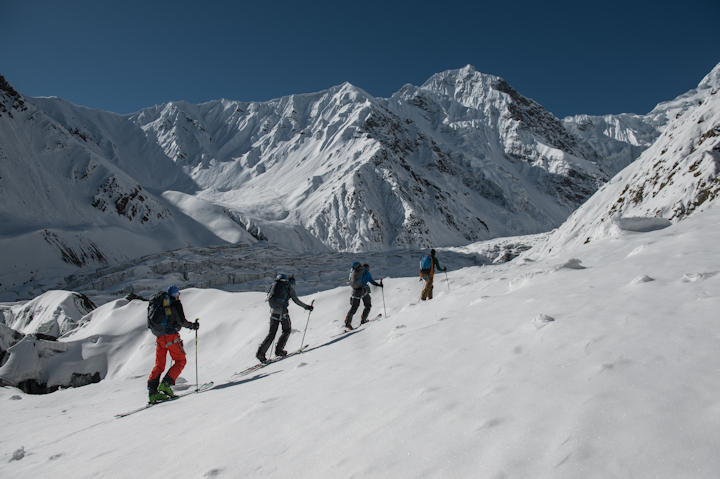 Before beginning our mission to climb the “Whitehorn” we acclimatize to the altitude in the adjacent Zarthgurben valley. 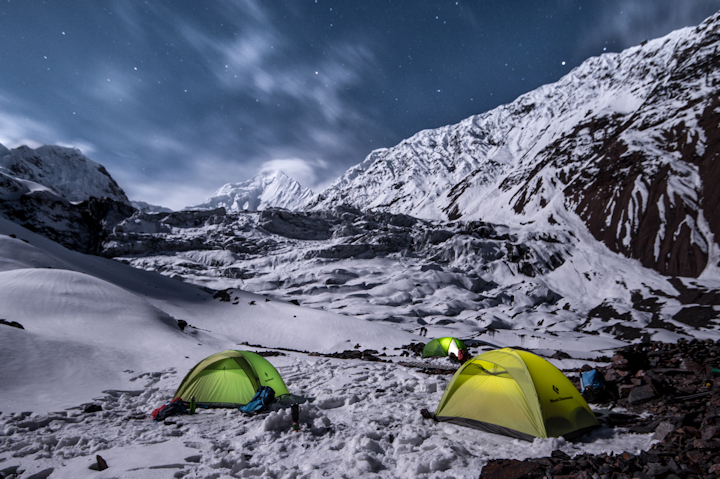 On the first night we made camp at 4000m. From the start I was glad to have my Milligram with me. With all my camping stuff the backpack was heavy, heavy but manageable. The next day we continued deeper into the valley. After five-hundred more vertical meters we were finally stepping into our bindings. After a week of driving and hiking, we were finally feeling the snow under our equipment. The area looked amazing for snowboarding, but only a day later we realize what we were dealing with. We’d hiked a steep ridge and slept at about 5000m in our tents. It was here that the unexpected happened: We triggered a huge avalanche. We were shocked, but a winter with minimal snowfall combined with a half meter dump just before our arrival made conditions unpredictable. The following morning, with the avalanche triggered and the face cleared, it felt safe enough to begin our first descent. The snow was icy and the terrain very steep, but at least it was safe. The board did not fail me. All I can say is that this first descent was a unique experience. Following a necessary rest-day we proceeded higher, this time without the boards. The climb was a first ascent of “Lob Zarth”, an impressive and challenging 5666m peak. 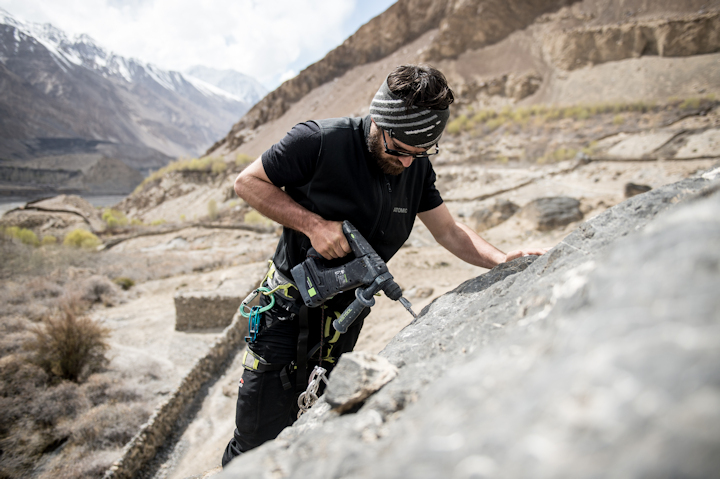 After successful acclimatization we returned to Shimshal and readied ourselves for the real mission. Finally, it was time to begin our attempt on Shimshal Whitehorn. 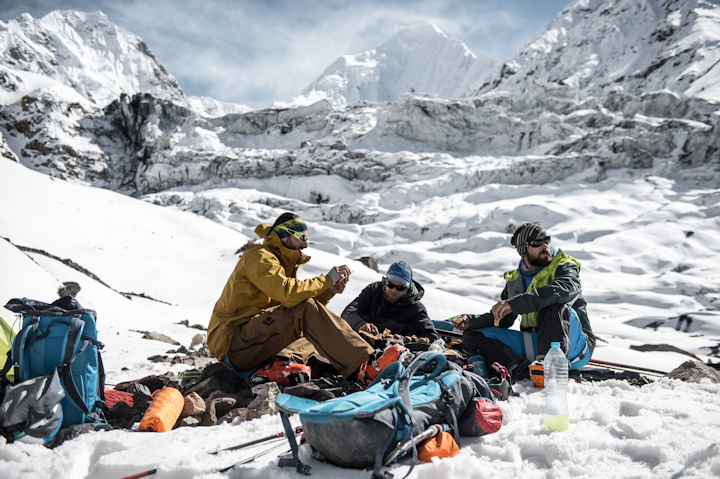 After two days of hiking we arrived at our Base Camp at 4500m and pitched our tents. Whitehorn was still far, far away. The following day we took a closer look at the north face in order to check the recent conditions. With every meter closer that we travelled, the dimensions of this huge glacier dawned on us. The terrain we found ourselves navigating through was like an enormous white maze, with huge, almost bottomless crevasses. Finding a safe route through it was not an easy challenge! Finally, stood beneath the towering north face, we were able to assess the conditions for the first time. An ascent via the north face would be totally irresponsible. Gigantic ice boulders were littered across the face and huge cornices hung from its shoulders; the danger of avalanches was too high. The only mountaineer that had ever attempted to summit Whitehorn from the north face never returned. Plan B wasn’t a possibility it was a necessity: We would make the first ascent of the massive “Couloir of a Thousand Gutters” which ran alongside the Whitehorn. 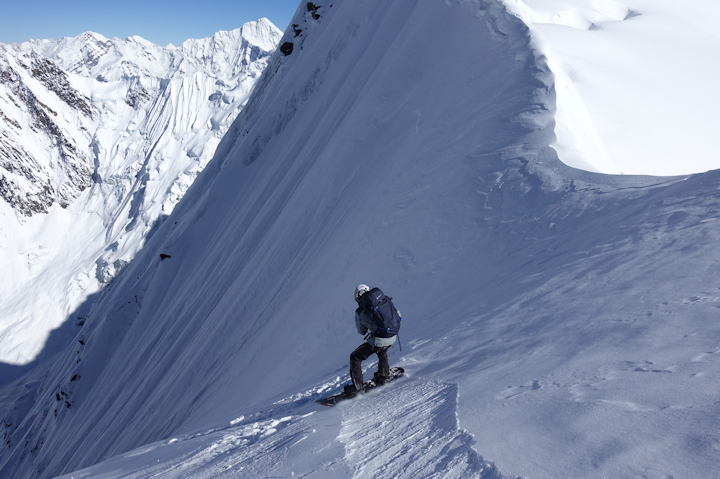 A couloir with an incredible 800 vertical meters and an average steepness of around 48 degrees. Only one group of mountaineers had ever climbed this couloir, but they had to turn back because of rockfall. After two further nights at -15°spent at Basecamp the weather appeared perfect. By this point, food was becoming very limited, because we couldn’t bring porters with us to this very remote area. We didn’t even know if we had enough reserves to reach the top. Our ascent started at 4:00 in the morning. By now we were able to navigate the white glacier maze very quickly and we started our ascent of the couloir at around 8:00. Again, the minimal weight of the Milligram on my back was a god-send. Still, the ascent brought each of us to our limits. Every 20 steps we needed to rest. The couloir faces west, a naturally triggered avalanche had already cleared the entire area. We felt confident that we could ride-down safely. After 8 hours of exhausting climbing in this steep terrain we arrived at the top of the couloir at about 5800m. The view was unreal. With ice axe in-hand I began my descent. The riding conditions were anything but good, the snow was terrible, but in this kind of environment the only priority is to arrive safely at the bottom. 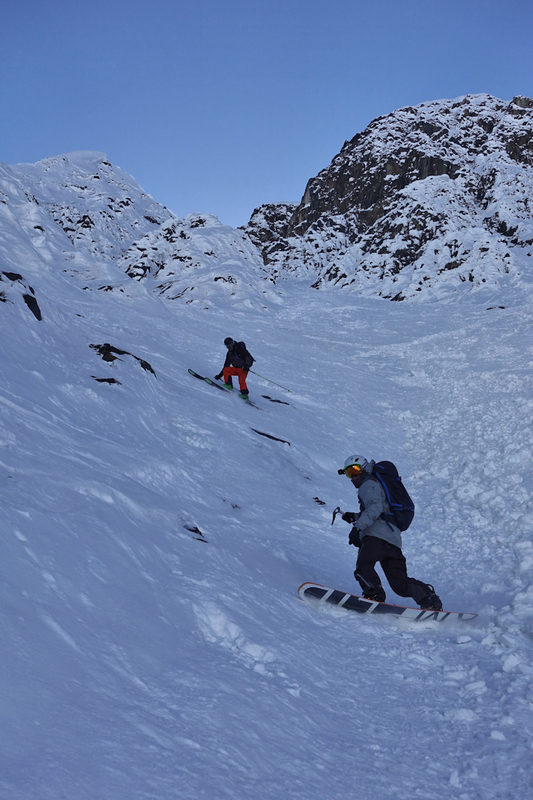 The entry to the couloir was perilously icy with about 55° of steepness. Every turn on my way to the bottom is a feat of strength. The feeling of achievement afterwards was awesome. Riding a couloir like this in such a remote and dangerous location is rewarding for all the effort that has gone into making it happen. We knew in hearts and our heads that it was the right decision to turn back from the Whitehorn’s north face this time. 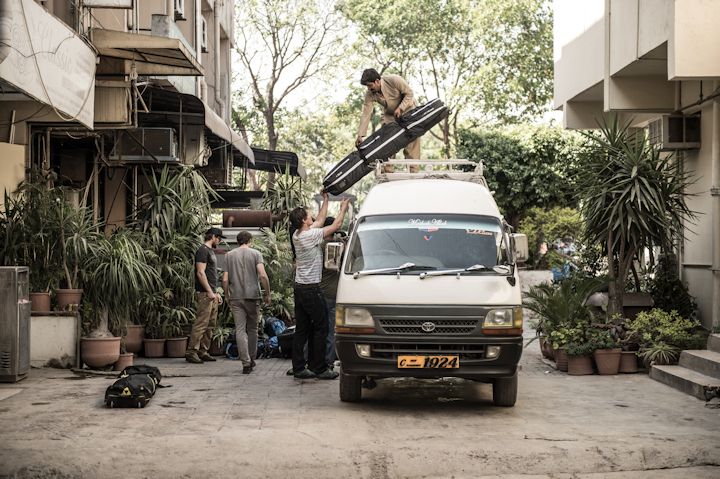 What’s most important is to return home, alive, with the whole crew.